A crocheted blanket sized to cover a seated person's lap and legs is often called a "lapghan." Crochet it in basic stitches, using knitting-worsted yarn and an I or J hook. Lapghan sizes average 36 inches wide by 48 inches long. 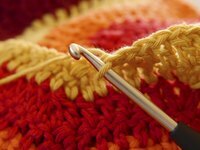 If you're adjusting from a full-size blanket pattern, you need only determine one dimension; once you establish the width-wise rows, crochet to the desired length. A linen stitch, which consists of one single crochet and one chain stitch repeating, resembles woven cloth. Starting with an even-numbered foundation chain, repeat the basic unit in every other chain, ending with a single crochet. On succeeding rows, work the repeat in each chain space of the previous row. Changing colors randomly at the row ends makes a pattern of interlocking stripes. Classic ripple patterns use double crochet sets, usually 6 to 10, alternated with increases and decreases. The finished blanket has a chevron or wavy appearance that is emphasized by changing the yarn colors to make stripes. Ripple lapghans can also be worked with one shade of variegated yarn. Granny squares use clusters of three double crochets and a chain stitch, worked in rounds with corner clusters to create a square. The squares can be any size, but four rounds -- each in a different color, using scrap yarn -- is typical. Join the squares together to your desired lapghan size. You could also make a one-piece striped blanket using “granny rows."